As of today, January 3, 2016, Missing Piece Awareness has educated over 1200 employees, managers, and owners of “mainstream” businesses in Autism Awareness and Acceptance!!! We are continually expanding and enhancing our training and promotional programs to bring attention to not only the challenges that many families with autism face, but more importantly, the brilliance and often masked giftedness of individuals with autism and the wonderful contributions made to the broader “mainstream” community. It is our mission to UNITE the mainstream and ASD communities, ending the fear, stigma, isolation, and fragmentation that often stands in the way of creating real opportunities and meaningful relationships between people. 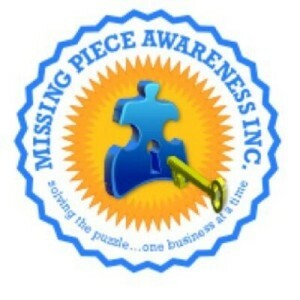 Missing Piece Awareness is committed to this goal by educating businesses, government, and civic leaders and their staff on the unique, hidden, and variable characteristics of children, teens, and adults on the autism spectrum. It is critical for individuals with autism, families with autism, caregivers, advocates and service providers to let us know what you need. Our recommendations for creating the sustainable change necessary to create a paradigm shift in the way the world views, understands and supports autism – is driven by the information we receive from you – the stakeholders. Please visit the family and advocate corner on our website and take the missing piece awareness survey – this is your chance to be heard and help us to begin creating a judgement free, cohesive inclusive world. Thank You to all of the wonderful businesses that believe in and support full community inclusion for ALL people! YOU are truly the “missing piece” to this mission and YOU are changing the world! Missing Piece Awareness is a Consulting Firm focusing exclusively on training businesses in autism awareness and acceptance. We are the only company in the country that trains and supports businesses in this area. We provide the opportunity for a business of any size to receive a certificate in autism awareness through hands-on customized training and ongoing support. Our trainers have extensive experience working with the special needs population in a community setting. We are headquartered in Long Island, NY, however, on-site trainings are conducted nationwide, Missing Piece Awareness differentiates itself from any other firm by providing one-of-a-kind training and certification. Businesses we work with receive tailored and decisive recommendations with swift implementation and employee training. Following this process, companies gain marketing opportunities, direct outreach to surrounding special needs communities, ongoing support and access to our experts. 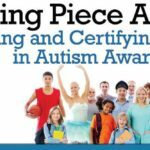 Working with Missing Piece Awareness, companies profit from the broad compilation of benefits that accompany the implementation of our autism awareness training. Recommend a Business You Would Like To See Trained!